The life of a stepmom is a daily journey. Each day can bring new and different challenges.The challenges are unique when the child's biological mom is deceased.You may think life is going along smoothly,then emotions arise out of nowhere at times from a stepchild. 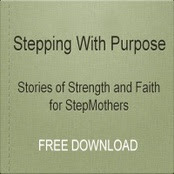 When a child allows more room in their heart for the stepmom, the child may feel like they are "forgetting" Mom. This is a fear some children have of their deceased mom. A child's emotional attachment to a deceased parent continues after death.Encourage children to keep their thoughts alive. One way as a stepmom to do this is to encourage the child to keep photos of her mom in a special place in her room. Use natural triggers of life to talk with your step child about her mom(e.g.,while eating at her mom's favorite restaurant). As a stepmom, be open to listen to stories about special memories with them.Also talk to your step child about how they can make room in their hearts for their stepmom also and still keep their mother's memory alive. God provides enough love for all the special people in our lives. If possible,keep the child and the mother's extended family in contact and involved in their lives.Besides all of the above,my days as a step mom may be something like this-taking her to school,making sure she has what she needs as far as school supplies,cooking supper,getting her to church activities and encouraging her involvment, preparing breakfast at times for the youth group on Sunday mornings,taking her shopping for clothes,doing a bible study with her,talk to her about friends and life as a teenager,take her to friends and have friends over,practice driving with her, take her out to eat,take her to get her hair cut, take her to orthodontist and doctor when needed. My husband and Hope's Dad is always there to help with all of the demands of life.I am very blessed to be married to him.That's another blog post-ha!! I am striving to learn to appreciate and enjoy today as a stepmom.Continuing The Journey!